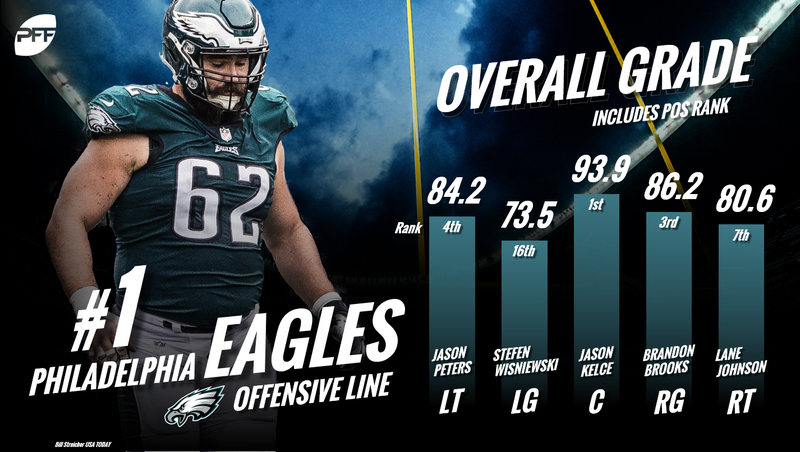 Originally published prior to the preseason, we at PFF put together our all-32 NFL team offensive line rankings for the 2018 season. After a few injuries and just days before the season begins, we revisit the list, to see how much, if any, have changed after the preseason action has run its course. Using a combination of grades, college evaluations, age projections and injuries through preseason, we’ve come to the following starting-five rankings. A year ago, the Philadelphia Eagles earned the top spot heading into the preseason, and after fueling a Super Bowl victory, they’ve once again placed themselves firmly atop our list and nothing has changed after that. There was a little projection here as we assumed nine-time Pro Bowl left tackle Jason Peters would return to form after tearing his ACL and MCL in October of last year. At age 36, Peters is currently slated to start in Week 1 and by doing so, the Eagles bring back the league’s best tackle tandem along with a top-five center in Jason Kelce and top-10 guard in Brandon Brooks. One need look no further than the divisional-round matchup with the Rams to know that guard is an issue for the Falcons. In that game, Aaron Donald racked up 11 pressures against the Falcons interior (albeit without Andy Levitre). They looked to alleviate that to some degree with the signing of journeyman Fusco from San Francisco (69.3 overall grade on 1,083 snaps last season) who head coach Dan Quinn announced is the team’s starting right guard. They’ve been solid everywhere else though of late, especially at center where Alex Mack has posted back-to-back 90.6-plus graded seasons for the Falcons. 2018 marks the third-straight season that the Steelers will have their starting five intact heading into the year. 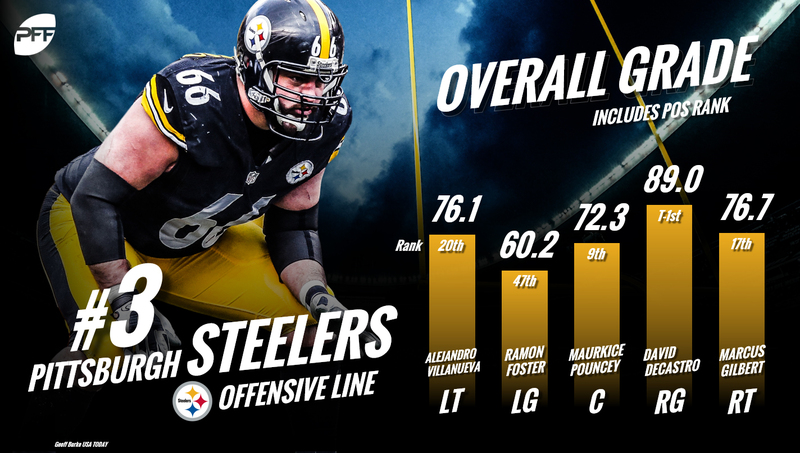 Expectations were ridiculously high for them heading into 2017, but an injury to Marcus Gilbert and an uncharacteristic down year from Ramon Foster hampered their effectiveness. Still, the entire starting five is 30 years old or younger and capable of recapturing their 2016 form.